This lion-shaped aroma was unearthed in the tombs of the Tang Dynasty in Xi'an. Its texture is talc, white, pure and slightly transparent, smooth and delicate, and moist and jade. It is made of two parts of smoked cover and smoked seat. It is 12.8 cm high. Covered with a round shape, the cover is raised, and a lion is carved on it. The lion stands upright, its head is high, its mouth is large, and its majestic is majestic. There is a deep hole in the center of the cover, passing through the lion's abdomen directly to the lion's mouth. The seat of the smoker is roughly hemispherical box-shaped, with a narrow mouth and a flat bottom. Its chamber is a burning incense chamber. There is a small hole in the upper part of the abdomen of the smoked seat. When it is a vent hole, the effect is to flow into the air to help burn. The bottom is a rounded square flat bottom. Four corners are carved out of the four corners, each of which is formed by laminating four triangular leaf-shaped layers to symbolize the mountains. It is a sculpture of the Boshan furnace from the Han Dynasty. Legacy. Incense customs, the Han Dynasty has been filled, such as Mawangdui Han Dynasty tomb unearthed. Henan Shaanxi County Culture and Management Association has a Han Dynasty yellow-green glazed animal pattern Boshan stove, the furnace body yellow green glaze, the lid covered with heavy hills, the middle dotted with birds and animals, the stove body decorated with a week of hunting patterns, beasts Lines, stove feet for three standing bears, unique shape, unique ingenuity. 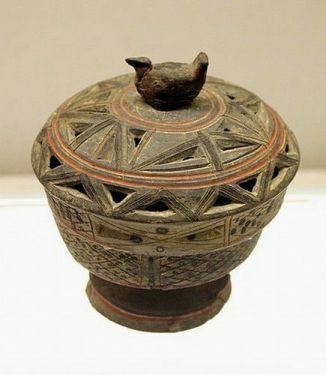 The most famous Boshan furnace was unearthed in the 1968 Han Dynasty tomb in the Manchurian tomb of a gold and silver Boshan furnace, shaped like a bean, Gai Xiaoboshan, through the wrong body of gold and silver. The top of the dragon holds a hearth plate. The upper part of the plate casts ups and downs of rugged mountains, the beasts of the mountains come and go, the tiger leopard runs away, the monkeys crouch on the cliffs or ride on the beasts, and the hunters patrol the mountains and rocks, depicting a beauty. Mountain scenery and hunting scenes, it is not only practical value, but also a precious ancient art. During the period of the Three Kingdoms and the Jin Dynasty, the clans were "all faced with shamisen, powdered and applied Zhu", which almost became a kind of fashion. The same is true of Tang, since the royal court and small family life, they have to incense. People with status also pay attention to using incense burners to burn incense and lavender. In the Tang Dynasty, there was a poem read: â€œSome of the Jin Jingjings donâ€™t burn, and the elephant bed is lying alone on the ramp. Where is the rhinoceros comb gold mirror, and the half pillow is blue and green.â€ The lion-shaped fragrance was revealed. Place position. The Song dynasty poet Li Qingzhao's "Phoenix on the stage and recalling the bragging cymbals" has a description of "a fragrant cold, a golden cymbal, and a red wave. She smoked and combed her hair, and Ren Baochao was full of dust. From the poetry of the Tang and Song Dynasties, it is not difficult to see that lion-shaped aromas are mainly used in daily life and are often used as supplies for women's mortuaries. This lion-shaped aroma was unearthed in the tomb of Madam Tang Yanggong. In the early bean-shaped fumigation furnace, the furnace body was relatively shallow and the furnace cover was relatively flat. The intake holes were often found in the lower part or the bottom of the furnace body, and the smoke outlets were covered in the furnace cover. This is because the earliest spices were herbs (aka aromas) and they themselves could be ignited after drying. This simmering furnace structure with many holes facilitates the full combustion of herbs. Later, a more aroma-rich spice from the outer domain gradually replaced the Mao. The imported incense is mainly resinous spices such as borneol, sufosin, etc. It is different from that of Maoxiang, and it needs to be burned on other fuels (such as charcoal). Different spices require that the shape of the fumigator be different, and the fumigation of the fumigated resin flavor should be done deeper so that the charcoal fire in the lower part can be placed on the charcoal fire to make it smoke slowly. Some censer designs in the Han Dynasty reduced the air intakes in the lower part of the furnace body to narrow gaps, and often closed them. At the same time, the furnace cover was raised and sparse holes were made in the cover to suit these spices. need. This lion-shaped aroma can be said to take this structure to the extreme: only a small hole in the upper part of the base is used as an air intake hole, so that the charcoal layer under the belly of the stove is not well ventilated, but can only maintain a slow overcast. The state of burning, while avoiding the disadvantages of too much charcoal and too much carbon, the lid was made into a lion shape, which increased the height, and the air flow needed to pass through a long hole in the lion's belly, and finally spread out from the lion's mouth. In this way, the upward flow of gas generated by the combustion will be distributed from the lion's mouth to the upper layer of the fumigation furnace, so that the aroma will be filtered and more pure and rich. It can be seen that this structure of lion-shaped aroma is suitable for the needs of resin-based spice fumes, and it truly achieves the perfect combination of internal structure and appearance. The lion-shaped aromas unearthed from the Caoâ€™s tomb did not contain the matching utensils used in smoked cages and other utensils. The specific uses of the lion-shaped aromas from the Caoâ€™s tomb were based on the fact that burning incense made the indoor air pleasant and pleasant, as well as mosquitoes. The function of dispelling evil and disinfecting and disinfecting. MOQ::	Small order is ok logo::	Embroidery or label . Usage::	Gifts,camp Payment::	L/C, T/T, western union, escrow etc.